The Bruiser is ONE TOUGH TANK! 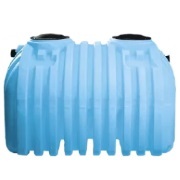 It can be used as a septic tank, a holding tank, a pump chamber or as a cistern tank for potable water. The world’s leading manufacturer of polyethylene tanks, NORWESCO has been producing polyethylene septic tanks since 1980. With that kind of experience, NORWESCO offers you proven products that you can count on for years of dependable, trouble-free service. 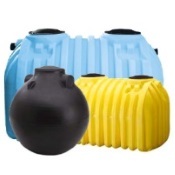 For septic system replacement and new home construction, NORWESCO‘s polyethylene septic tanks are designed for durability and quick, easy installation. Any NORWESCO septic tank can be transported to the job site in a pickup truck and carried by just two people. That enables you to install the tank on your schedule. All NORWESCO septic tanks are manufactured by means of the rotational molding process, which produces a one-piece, seamless, watertight tank. 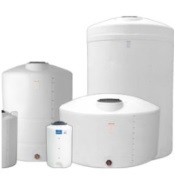 Polyethylene is unaffected by soil chemicals and by the chemicals and gases present in sewage, so NORWESCO septic tanks will not rust or corrode and require no additional coatings as other tanks do. NORWESCO’s strict quality guidelines ensure an environmentally safe septic tank. NORWESCO septic tanks come equipped with manhole covers and detailed installation procedures. Manhole extensions and lid/riser combinations are available to bring tank access to grade and to meet code specifications. The 750, 1000, 1250 and 1500 gallon sizes are available in both one and two compartment configurations. NORWESCO septic tanks are for BELOW GROUND USE ONLY. Using the tanks above ground may result in deformation of the tank. It is far more cost-effective to utilize one of NORWESCO's above ground tanks that are specifically designed for above ground use and applications. PRE-PLUMBING: All of our NORWESCO septic tanks that are 750 working gallons and above are "pre-plumbed" with PVC inlet and outlet assemblies. 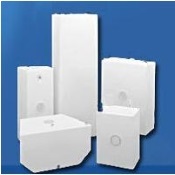 Assemblies and their components are made of either SDR35 or SCH40 PVC depending on state or local code requirements. 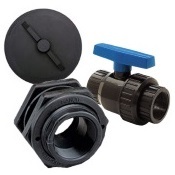 All assemblies are sized according to code requirements as well. Finally, an EPDM gasket is placed between the "T" assembly and the tank wall to assure watertightness. NORWESCO septic tanks will arrive to you ready for installation. 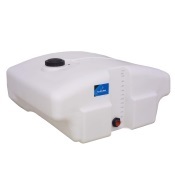 WATERTIGHT DOMED LIDS: All septic tanks manufactured at all facilities, are equipped with a watertight domed lid. 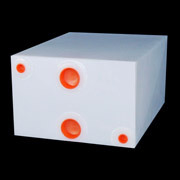 This domed lid is significantly stronger than previous lids we have offered. When leaving our factory, the lid(s) will be attached to the tank with stainless steel screws and come standard with a foamed, polyethylene gasket between the lid and the tank. This gasket provides a watertight seal at the lid area. MANHOLE EXTENSIONS AND LID/RISER COMBINATIONS: Again, at all facilities, the notches in the manhole area(s) of the tank have been removed as the "interruption" in the manhole, or circle, weakens that area. The lugs on the accessories have also been removed. See tank accessories for more information on the accessory items. NORWESCO septic tanks are backed by a full three-year warranty and have been certified by state and local health departments from coast to coast. 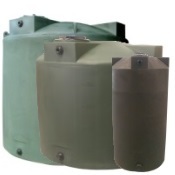 Where applicable, NORWESCO septic tanks have been certified by both IAPMO and CSA. Across the United States and Canada, there are certain health code requirements that our tanks must meet. These codes are regulated by the state, county or province.